A goodie-two-shoes type of person won't ever receive much support from anyone. A "righteous" person, in the way that Paul uses the word in this verse, is "upright" and, as a result, is rather annoying to everyone… and no normal person would sacrifice their life for such a prude. Some people might, however, be willing to die for someone who is genuinely good… a person who is for the most part kind and humble, a person who is responsible and honorable, a person who exhibits character and inner strength. 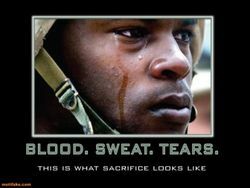 In fact, we have soldiers that do this sort of sacrifice all of the time for the people of their country. I am so amazed an impressed by my friends and family members that have put their life on the line so that other good people would be able to live and be free. Some people might consider it worth their life for such people to be spared. In relative terms, the snobby pharisee is not worth the sacrifice, but the common decent person might possibly be. As Everett Harrison points out in his commentary, the action of Christ is "distinctive, unexpected, unheard of (cf.John 3:16)." (59) Paul expresses the phrase "die for" four times in verses 6-8 in conjunction with the preposition hyper (ὑπὲρ), meaning "on behalf of" or "for the sake of". Harrison suggests that Paul could have used the word anti, meaning "in the place of" or "against"… which would have alluded to Jesus dying as a substitute for us, against what we deserved. (59) But instead Paul uses the word hyper, allowing him to still communicate that idea of substitution but with the added concept of Christ's proactive, loving action at just the necessary moment. It's as if Jesus, as a soldier, actively fights on our behalf, empathizing with our pain, taking the body blows that come from our own amunition, offering his blood, sweat and tears for our sake. It was our iniquities that crushed him, it was our suffering that he bore, it was our transgressions that he let pierce him, it was our pain that he carried. And instead of beating us back with his abilities and power, he silently withstands the onslaught and then remarkably, takes the consequence that should have been ours. As Isaiah 53 says, the punishment that we deserved was on him… and we were given peace. Who will save us, the fallen enemy who has sinned against God? Jesus says, "I'll do it." *References from Harrison, Expositor's Bible Commentary, Romans edited by Gaebelein.